Let me just start out by saying.....my camera is missing and I'm pretty sure I know who has it. I spent the last couple days in my home...town? No, it's not a town.....Well, I just spent the weekend in the mountains of Upton. 6 out of 7 of the people in my house are sunburned somewhere. Two of those are Indian. So that means we got a lot of sun. I have all kinds of great pictures of us but as I was looking to upload those pictures, I realized that my camera is not here. So, unless my sweet husband pack the camera with him, it is still in Upton...or somebody else's car. So here's what I'll do; I'll post old pictures of the same scenery. When I uploaded this picture, I didn't realize Shem was crying. Am I bad mom cause it makes me giggle every time I look away and look back at it. At this reunion, this pond was full of kyacks and kids. There were races and splashing and kids swinging into the water from the rope swing. As soon as the zip line was discovered, kids were climbing the tree and zipping down into the water. Where were the parents? We were all under the shade of a tent. There were 5 out of 6 kids there. Kristee was the only one missing and that's cause she's in the Dominican Republic. I don't think I've ever laughed so much. I will just say, there were discussions (of which I didnot partake in) that I never imagined taking place as a child. There was talk of receding hairlines--I think I'm still okay and future children (most of us are done) and there was chess. Did you know it took 5 of us to beat one brother and that was after he already put my sister in checkmate but took it back several moves so we could have another chance. We had egg olympics. My oldest two each won a painted noodle medal. At the end of the day and the 1 1/2 hour drive home, the kids slept and I was able to contemplate the days ahead of sunburns and slivers and how long it might take to recoperate. Luckily, it's 7:49pm now and all in my house are happy. We took a while to get there, but we're good. There will still be some whining (we did get some serious sun) and pealing, but every minute of it was worth it. I never knew my family could be so fun. that picture is classic. how did you ever get that? i just don't get great shots like that! Here's my confession (and adds to the bad mom). 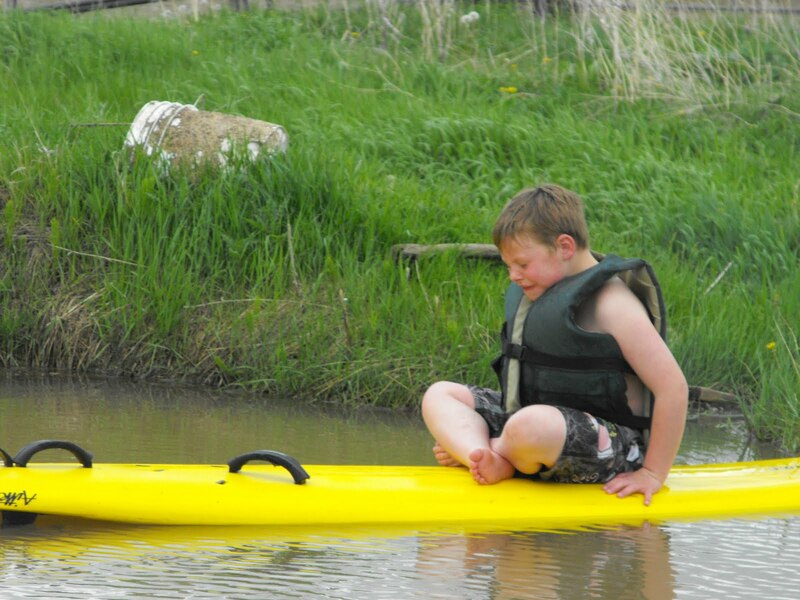 Shem was out there and couldn't paddle back to the shore line he was wanting and started this cry. When I noticed he was crying, I asked him to keep crying so I could take the picture. 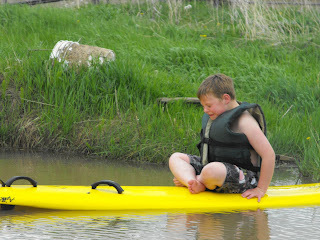 He complied and then I saved him by handing over a paddle. He's a crackup! OH!!! that is wonderful!!!! lol!!! HILARIOUS! my heck, the story is as good as the picture!